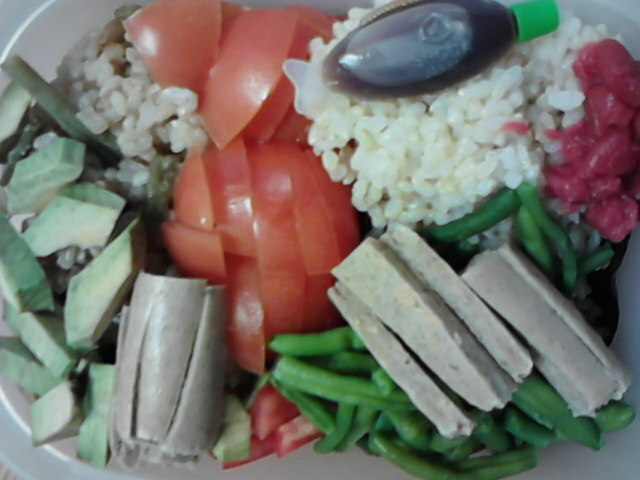 I took this simple Bento to work for lunch the other week. It just shows how something simple can be so yummy!! I love colourful and healthy lunches, they make the day that little bit brighter. What did you have for lunch today? Did you save money by making and bringing your own to work, or did you have leftovers? I used my Aladdin Bento box 😀 and I had rice noodles, quorn mince stir fry with veg, sliced tomato, and umeboshi and sweet cucumber pickle. The quorn mince stir fry was seasoned with sushi vinegar, soy sauce, garlic and ginger 🙂 and had added shelled hemp in, for added protein. What do you reckon would be a nice easy kyaraben bento theme to start off with? 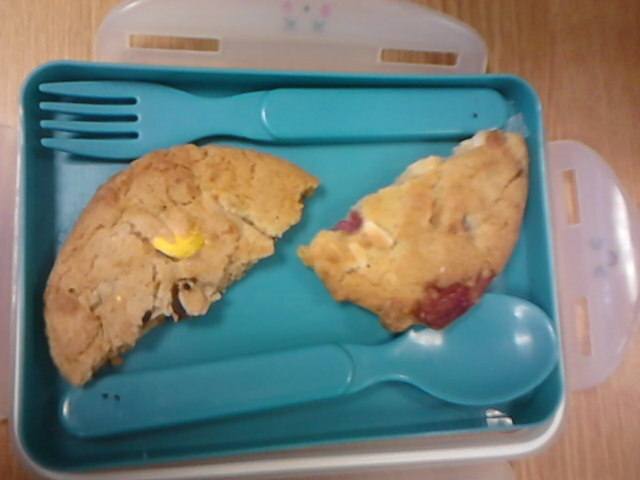 Today, I didn’t use any of my Bento boxes D: shock horror! I had 2 brown rice star shaped onigiri (and extra brown rice) with soy sauce in fish container. Leftover white rice and roasted pumpkin. All on a bed of lettuce with sushi pickled ginger, umeboshi and sliced avocado. I feel like I’ve spoilt myself today!! First is the bf’s bento. 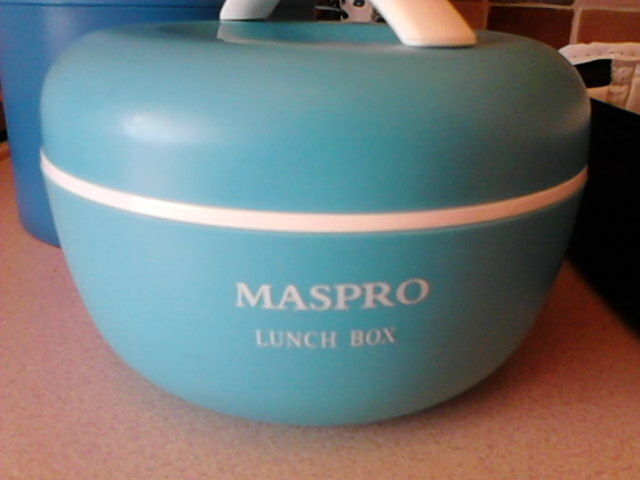 I used his blue MASPRO lunchbox (full review to come later). In the main part (which is perfectly sized for a reasonable amount of food – more akin to a dinner sized portion really), he had sushi rice with steamed veg and pickled beetroot. 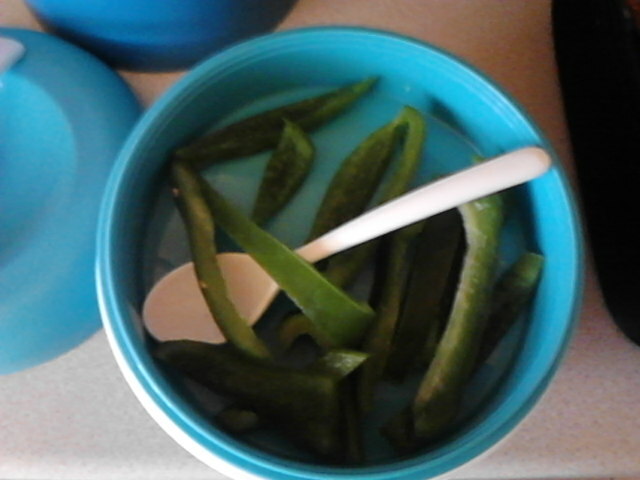 I also cut up some green peppers for the top part. We are upping the veg at the moment (as less fruit = less sugar) so the more the merrier 😀 He also had some fruit and malt loaf to complete his yummy lunch, lucky him! 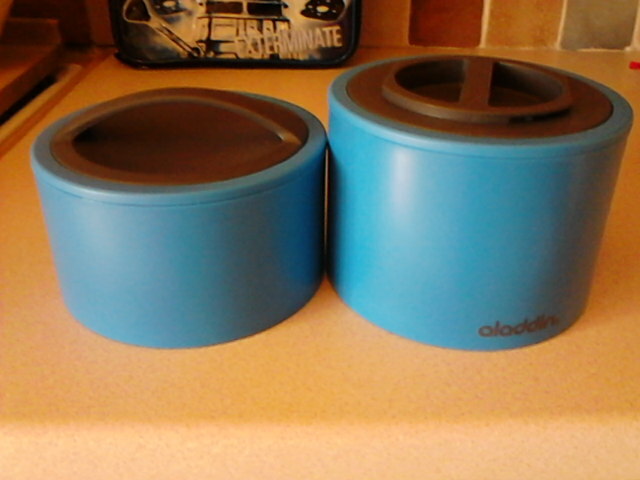 For my bento, I used the fabulous Aladdin 0.95L bento box (for the first time!). 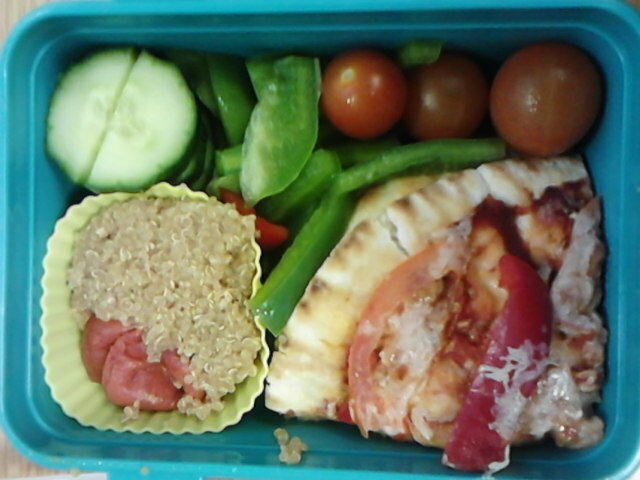 I have had this bento box since last Christmas (I know, bad me!) and I cant believe it hadn’t even been out of its box! I had sushi rice in the bottom compartment with furikake and umeboshi (I love them!! 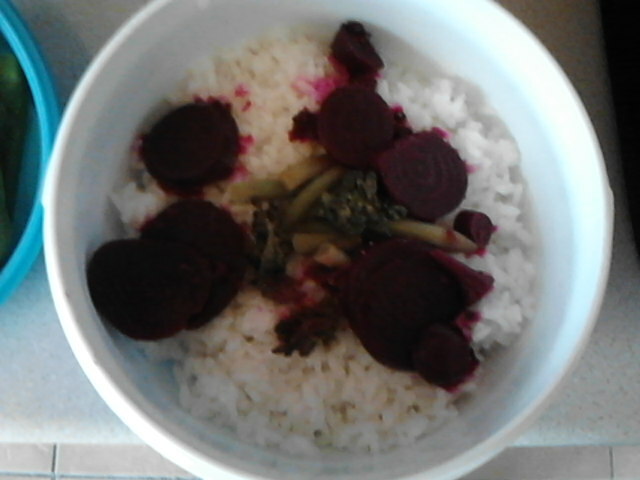 ), and steamed veg and pickled beetroot. 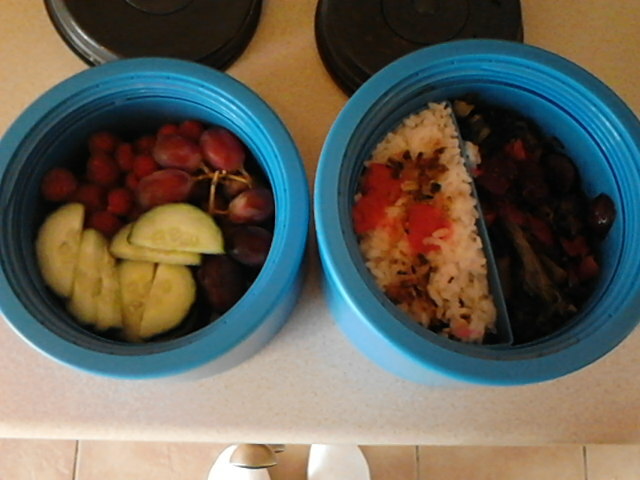 The smaller compartment was filled with cucumber, raspberries (from my garden) and grapes. 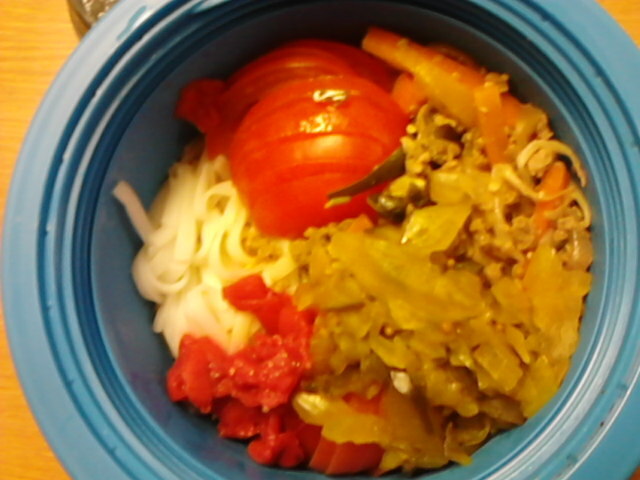 I love this bento box, I can’t wait to use it for soups and food that can be heated (at work). Today is the day I will declare my love for Umeboshi. Japanese Pickled Plums are amazing, and it is such a shame that I did not try them as soon as I started trying out Japanese recipes and creating bentos. Umeboshi are Japanese Pickled Ume Plums and the name literally means dried Ume (fruit). They are usually served as side dishes to rice or used as fillings or accompaniments for rice balls. They look very wrinkled and ‘pickled’ 😛 and taste very salty (umeboshi is also translated as salted plums) and quite sour. 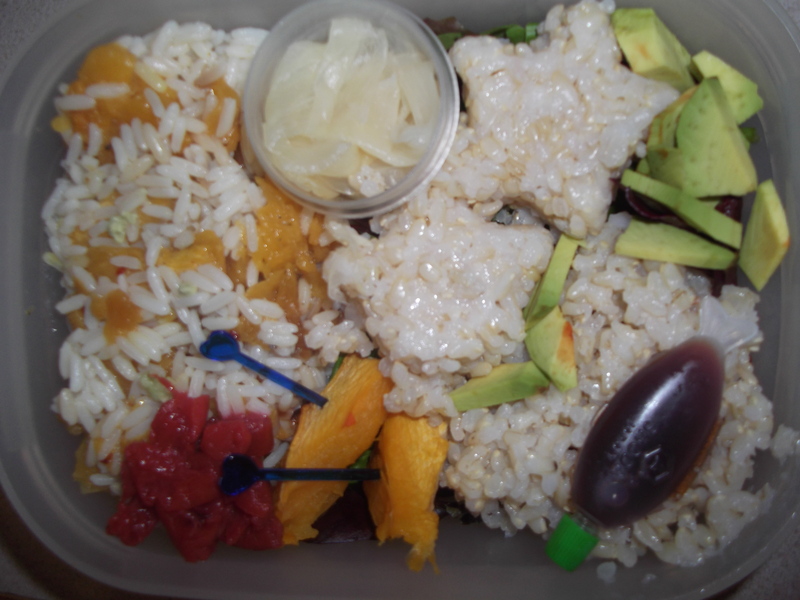 As part of a bento (Japanese lunchbox), a single umeboshi is often placed in the centre of the rice to recreate the flag of Japan, the Hinomaru Bento. Umeboshi is claimed to fight bacteria. 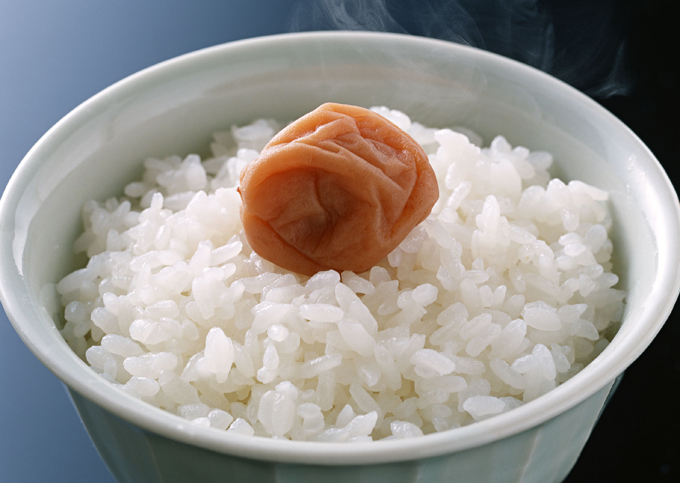 It is claimed that placing an umeboshi on the rice will inhibit bacteria (umeboshi are over 20% salt and salt acts as a preservative). 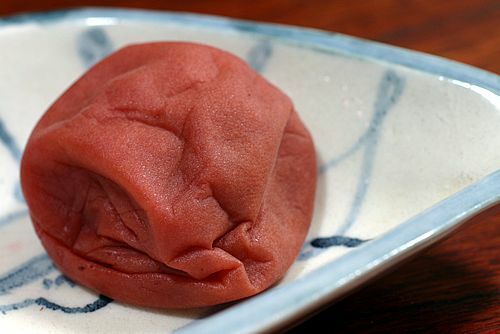 The sour and salty umeboshi is also claimed to help digestion. It is also a common ingredient in onigiri, rice balls wrapped in nori, and they may also be used in makizushi. Makizushi made with umeboshi may be made with either pitted umeboshi or umeboshi paste (which is cheaper), often in conjunction with slivered fresh green perilla (shiso) leaves. They are just divine with sushi rice. Perfect for bentos (see above) and so good for you!!! They are a superior pickle and a joy to eat. I’m sure a lot of other people will not share my love for Umeboshi but I do urge you to try them. They should be found in most asian supermarkets, or, if you are like me and are miles from the nearest asian supermarket :(, you can order them from the many online sushi, asian and japanese stores.